Red Bull Racing driver Mark Webber has said it will be a "no-brainer" to use the Kers power boost system in this weekend's Malaysian grand prix. Mark Webber bounced back from his disappointing Australian Grand Prix to dominate an eventful opening practice session for the Malaysian Grand Prix on Friday morning. Just as he did in Melbourne, the Australian set the pace in P1, but unlike there, he was never challenged for supremacy during the first 90 minutes in Sepang, his Red Bull some 1.665s faster than Lewis Hamilton managed in the McLaren. Somewhat surprisingly Red Bull did not use the device in the Formula One season opener in Australia, yet still outpaced its Kers-equipped rivals as Sebastian Vettel drove to a comfortable win. 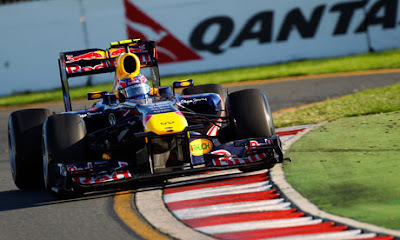 The team had difficulty with the system in practice at Melbourne, and elected to forego the intermittent speed boosts for the sake of better balance around the Albert Park street circuit. However, the long straights at Sepang put a greater emphasis upon straight-line speed and Webber hinted the team will use Kers if it works out in Friday's practice sessions. "We will get some more confidence tomorrow," Webber said on Thursday. "It's a no-brainer. You need Kers. If it's working reliably and well, you should have it on the car." Webber said the adjustable rear wing will also be a much greater factor in Malaysia than it was in Australia. The layout of the Melbourne track meant any speed boost on the short straight from lowering the rear wing was negated by the line advantage leading cars had going into the first corner. Sepang's straights are among the longest on the F1 calendar, and the new adjustable rear wings should show their true benefit, with expectations of plenty of overtaking. "Here will be a completely different story," Webber said. "If it doesn't work here, I don't know where its going to work." He struggled compared to team-mate Vettel in Australia, labouring into a distant fifth place, after suffering difficulty with tyre degradation and being forced to pit earlier than hoped. Degradation will be even more of an issue in the tropical heat of Malaysia, with tyre provider Pirelli forecasting three or four-stop strategies in the race. "Its pretty brutal with track temperatures which will be tough on the tyres," Webber said. "This is the most extreme situation they have faced as a company."